Your credit score is a numerical rating that represents your “credit-worthiness” and is determined by what appears on your credit report. The score ranges from 300 to 850 and is based on your credit history, and helps lenders evaluate your credit risk. Some of the factors that affect your credit score are your total outstanding debt, how many open accounts you have, missed and late payment history, and tax liens. People with higher credit scores are typically able to have increased borrowing opportunities at more favorable interest rates. 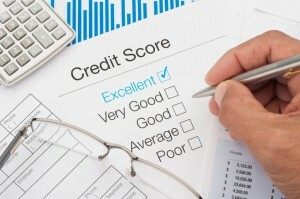 A low credit score can prevent you from obtaining any type of loan, including a mortgage or an auto loan. If you are able to borrow money with a low credit score, you’ll pay for it with higher interest rates. If you find that your number falls on the lower side of the range, here are 5 easy ways you can improve your credit score. 1. Pay down credit card debt. Paying down your revolving debt (debt that has an outstanding balance that does not have to be paid in full each month) is one of the fastest ways to improve your credit score. If you can’t get rid of your revolving debt entirely, try to keep your balances below 30% of the credit limit on each card, less than 10% is even better. While it is generally recommended to pay down your highest interest credit cards first, it can be an even smarter move to pay down the cards that are closest to reaching the available credit limits. 2. Get an installment loan. While it may seem counter intuitive to get a loan if you are trying to improve your credit score, this type of loan can actually help you build your credit score. An installment loan is a loan you can pay back over time, such as a mortgage, auto loan, student loan, or a personal loan. By paying your installment loan on time every month you are showing the credit bureaus that you are responsible with credit. 3. Always pay on time. A history of late and missed payments on your credit card, mortgage, or other loan can not only lead to late fees and penalty interest rates, it can also wreak havoc on your credit score. If you have trouble remembering to pay your bills on time, take advantage of payment reminder text alerts or enroll in automatic payment programs. If you choose an automatic payment program for your credit cards where an amount is debited from your bank account every month, try to set up a payment that is more than the minimum amount due. Your credit score should increase as long as you continue to pay your bills on time. 4. Don’t close unused credit cards. It might seem to make sense that closing out credit cards you don’t use would increase your credit score, but that’s actually not true. Why? Because it increases your credit utilization ratio, the ratio of your credit card balances to your available credit limits. Showing that you have credit availability from an unused card, but are not using it, can have a positive influence your credit score. 5. Check your credit report. According to a Federal Trade Commission study, five percent of consumers had errors on their credit reports. The Fair Credit Reporting Act (FCRA) requires that upon your request, the three nationwide credit reporting companies (Equifax, TransUnion, and Experian) must provide you with a copy of your credit report free of charge once every 12 months. By checking your credit report every year, you can identify and resolve any areas of concern. If you see an error, you should write to the credit reporting company and tell them about the problem. The company is required to investigate the issue within 30 days. For more information on checking your credit report, and the importance of doing so, watch this FTC video.